I love summer fruits. Berries, melons, peaches, plums, pineapple. Yummy! I also really enjoy yogurt. That could explain why one of my favorite snacks are fruit and yogurt kabobs. My kids love to make these, and gobble the up quickly. I can serve them to the kids as a side dish, or just as a fantastically healthy snack. Grab your favorite fruits and cut them into bite size chunks. Obviously this isn’t necessary with all fruits, black berries and blue berries can be used whole. 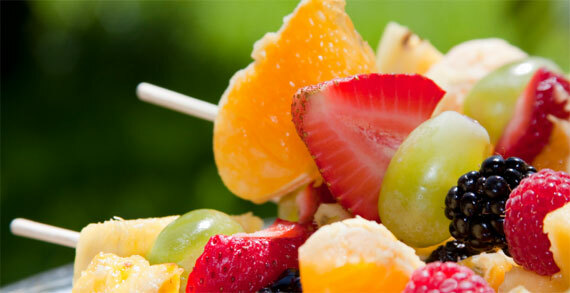 Skewer your fruits onto some kabob skewers. My kids do most of this part. They like to pick their own fruit combos for their kabobs. Plus I think they enjoy stabbing things. Perhaps I should worry? Plus I think they enjoy stabbing things. Perhaps I should worry? Regardless they skewer all the fruit, and I supervise to make sure there aren’t any strawberry only kabobs, or anything wonky like that. Then each kabob gets a good healthy dipping into some vanilla yogurt, and is placed onto a parchment lined baking sheet. My kids come back to help again by sprinkling the kabobs with granola, or graham cracker crumbs. Sometimes if I am feeling saucy I even drizzle some chocolate on top. Then our creations go into the freezer for a few hours. The yogurt freezes into, well, frozen yogurt, and the fruit is a yummy center. These would be great for a barbecue desert, or afternoon coffee date. Whenever you choose to enjoy them is fine. You and your kids will love the fact that they taste like an ice cream treat. You will also love the fact that they are good for you!